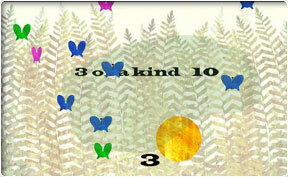 Use your mouse to draw graceful lines and loop around butterflies of matching color. Visual design inspired by the work of children's book author Eric Carl. One of Gamelab's very first games. We were interested in designing new forms of interactivity at Gamelab, and LOOP was an attempt to use the mouse input in new ways. The watercolor graphics of the game were quite distinctive for its time.